Movable,can be used inside or outside of warehouse. 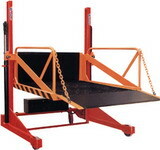 Ideal for loading containers with pallet truck or stacker. Heavy-duty cylinder with safety velocity fuse and pressure compensatef flow control valve.